In Ear Matters: Return of the J(edi)H Audio. I know exactly how some of you might feel when you read this news: What is going wrong with the manufacturers these days? No disrespect to UE or JH Audio, but I'll have to say the number games really need to stop (or at least slow down a little bit). Did anyone care to really discuss why more drivers make for a better IEM, or should we just have to swallow down the more-is-better theory without ever questioning its validity? So we finally reach the quantity-is-the-new-quality phase of industry development? Anyway, I am sure you are not here for my little rant, so lets move on to the actual news. 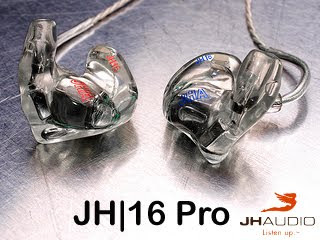 JH Audio just announced their new flagship, the JH16 Pro, featuring 8 drivers per side with double dual lows, single dual mid, single dual high. It will cost you around US$1150. With so many exciting news lately, I am really begin to feel bore already... seriously.